NO THIRD PARTY BOOKINGS! NO EVENTS/PARTIES. NO LOUD MUSIC. NO PETS! 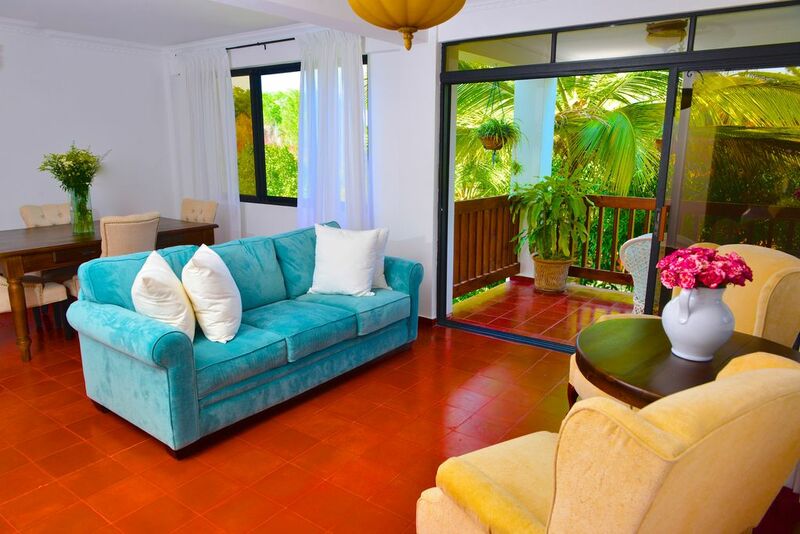 Our Villa is an amazing 18 People Villa for a large group or family. We have 8 bedrooms each with its own bathroom. We are a beautiful retreat in the middle of the Alps in Jarabacoa. Rooms are dressed in white bed linens, feather-down pillows. Common spaces with terraces, garden gazebo and bar/lounge used as a space to disconnect and enjoy television. We supply all bed linens, and towels and soap. Just bring your personal belongings. Please note there is an extra charge of $40usd per night for Air Conditioner. NO PARTIES. NO PETS of ANY KIND. Only those guests accounted for on the reservation will be given access to our community and Villa. We love to work in the community of Jarabacoa and feel that we were called here to help those who are less fortunate. We spend our time working with children and working with families in nearby communities. The dream is to bring people back together with nature and have them escape or reconnect with each other. We want to share the peace and love that we have experienced since we purchased. We are more of a classical location, not modern but classic. We have all comfortable furniture and our beds and pillows are of superior quality. We are also in the middle of the Alps giving our guests a sense of privacy and seclusion. We are in the middle of the Dominican Alps. Most rooms have a great view of the Forrest and deep woods. There is an additional $40usd Per night fee for this feature. Must be paid in Cash if you desire to use this feature upon arrival. We provide linens but there is not a Linen change during your stay. Light dishes and utensils. Light pots and pans. Kitchen has supplies needed to cook simple meals. There are several dining tables through out the Villa. No Pets of ANY KIND! Please note Air Conditioner Use will be an Additional $40.00 Per night. Absolutely NO pets. NO SPEAKERS OR LOUD MUSIC. NO PRIVATE EVENTS. I was not sure if his would work for our group of 7. But the pictures do not reflect how great this place is for the price. We arrived early in the morning and check-in Process was smooth. The owner Vanessa is quite friendly and really goes out of her way to plan our stay. We opted out of the Meal plan. I think it's around $34.00 a day because we wanted to explore mostly. The continental breakfast that was included was great. Really nice presentation and their coffee was surprisingly tasteful. They have a lot of attention to details and the floor we stayed in all had air conditioners and the beds were comfortable. I would recommend this place for large groups. Beautiful Mountain Retreat ...& even better hosts! I have been to Villa Celeste multiple times. David and Vanessa are great hosts that provide great hospitality, comfortable beds, clean rooms, beautiful grounds, and really good food! If you are looking for a quiet place to relax, this is the place. But if you are looking for adventure, Villa Celeste is also the place because it is in the heart of many fun day trips! David & Vanessa are great about helping direct you to the fun things in the Jarabacoa area like White Water Rafting, Paragliding, Mountain & Waterfall Hikes, Golfing and a couple of 5-Star Restaurants. Rancho Jarabacoa:	Closer to Villa Celeste Estate. Small but personal service. The BEST horses for horseback riding in the area. Horseback riding on average $10.00 per person. Assisted tour visits to Waterfalls about $20.00 per person. Other hikes etc. you must call for information. Flying Tony - It’s one of the most beautiful experiences to bond with nature that one can experience. Fly over the mountains of Jarabacoa (You should not leave Jarabacoa without the experience. Costs: $60 per person. Reservation is required. Our favorite: Salto Jimenoa 1 - For those who want a more authentic experience a fall that is less frequented by tourist, this one is good and a nice 1 hour hike up and down. 2nd favorite: Salto Baiguate - great experience for all. Children above 5 years old can enjoy. The stairs are very steep to the bottom but worth the climb up. 3rd favorite:	Salto Jimenoa - famous and a large tourist attraction. Best highlight are the wooden bridges. Mogote Hike – (about 4 – 5 hours experience) –The drive is about 35 minutes away. Nearest Beach: Puerto Plata – about 1 hour drive – we recommend a day pas at Casa Colonial for $25 USD per person. Dinner at Blue Jack Tar Village. NO PETS PERMITTED of ANY KIND. NON SMOKING PROPERTY!